In this year’s culinary movie-you-gotta-see, Chef, Carl Casper, played by Jon Favreau, explains to his son why eating Andouille sausage is better in New Orleans than in LA. “It’s not the same,” he says. 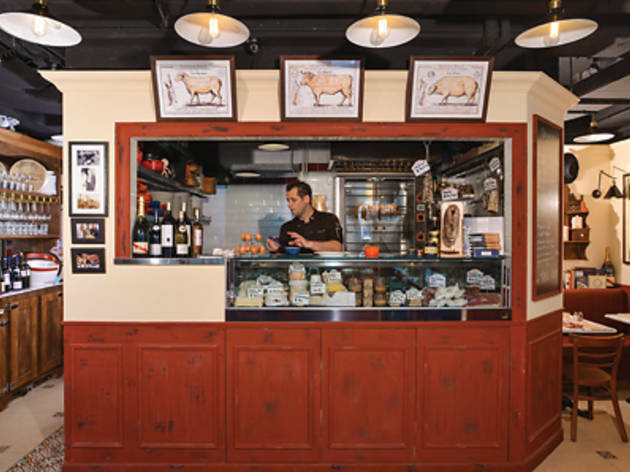 “When you eat it here it reminds you of a whole world of memories that you have from being there.” That sentence sums up French food in Hong Kong. It’s often exceptional but you can never imagine it matching up to the best culinary offerings from, perhaps, Paris or Lyon or La Rochelle. Until now. 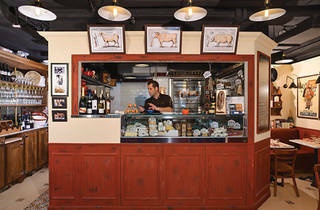 Headed by former Chez Patrick catering chef Laurent Brouard, Jules Bistro in Happy Valley features an open deli counter and wooden panelling, as well as an array of early 20th century posters. The decor doesn’t deviate a single bit from that of a classic bistro. And, here, Brouard has been allowed to really stretch his culinary wings and cook the French food the way he wants. That means it’s traditional and done to extremely high standards. The specials board looks tempting so we start off with a venison and foie gras terrine ($148). It’s a well-seasoned creation without a hint of gaminess and it works wonders with the crusty walnut raisin bread. Next up we go for the escargots à la bourguignonne ($86). The plump snails are immersed in a garlic and parsley pesto and there’s loads of butter swimming on the plate. The pesto is aromatic and smooth, and although there’s no red wine jus in sight as the name suggests, it doesn’t matter. The ensemble is so en pointe in flavour, we mop every last bit of juice with our bread. With starters this good, we eagerly anticipate our mains and they don’t disappoint either. The French classic duck confit ($168) is easily one of the best in Hong Kong. This slow-cooked dish is neither too salty, gamey or oily, and the skin is expertly pan-fried to a crisp – indicative of Brouard’s precision and skill. Another star of the evening is the veal sweetbread ($238) that’s dusted with the perfect amount of dry herbs and fresh parsley. When paired with the mashed potatoes, the magical buttery offal taste combines with the starch to enhance the seasoning on the back-end, siphoning away any bitterness from the organs. The traditional French method, done with flair. To finish things off, we plump for the Bordeaux canelé ($58). Again, this is as fine as traditional can get with its soft custard centre and a dark, thick caramelised crust. The rum flavours are strong yet devoid of any alcoholic bite. In fact, the only cloud in this otherwise glowing review is that the pastry is cold and its consistency is slightly gummy as a result. Jules Bistro G/F, King-Inn Mansion, 13-15 Yik Yam St, Happy Valley, 2838 1115; bistrojules.com. Dinner for two: $800.